The most important skill? Dealing with Panic!. I have always modeled safety as a “cone” in the water that is point down. Think of yourself as safe inside the cone. That’s a spot where you’re okay. But, when you start to drift off center, and then even outside of the cone, you are may be in for trouble. When you are completely outside of the cone … well, sorry, chances are increased you’re not going to make it. To surive an, off-center, experience you need two things: to know where the center is, relative to your current position and to have the skill to maneuver your way back there. It’s kinda like a virtual type of cave diving, but there is not gold line, the only guide line there is one that you’ve laid by honing your knowledge, skill, and self-control. Knowledge, skill, and self-control, are created through training, through experience, and (most importantly) as the product of an interactive term dependent upon both. There are two critical things: how to stay inside the cone (diving within the limit of your training), and … what it feels like to be a little off center, to need to move back toward (to) the middle. As you slowly extend your diving to things that, perhaps, you’ve not had specific training for, you know know how to keep yourself in the center of the cone. Even as you go deeper (figuratively) and the circle scribed by the intersection of the plane of your depth and the cone narrows, staying as close to that middle becomes more and more critical. You must know, at all times, how far off the middle you are. You know know, at all times, how to get back to the middle. Panic is the result of the instantaneous chaotic jump from inside the cone to somewhere outside the cone, with little or no frame of reference as to how to get back. This is sometimes the result of a single, big, possibly predictable or possibly stochastic event, but more often it is the result of a series of small displacements, each one oft unnoticed by itself, each multiplying (rather than adding to) the one(s) that came before. That is what training and experience teaches you to recognize … it is not just the displacements, it is both the vector and the first derivative or even the second derivative that amplifies the aforementioned chaotic jump out into the unkown and results in panic, injury and even death. 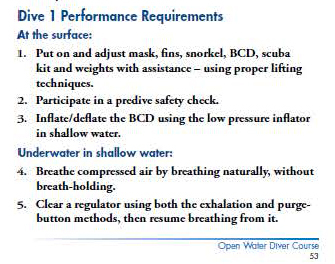 What is the difference between, say, Parker Turner struggling to get to the opening till he passes out and the new diver clawing his way to an embolism because his valve was not open all the way? Is either case just bad luck? Is either case the result of not respecting the limits of training? I don’t really know … some would say that it is a lack of imagination, while others would say that it is strength of will. If I had to guess, I say that Parker’s lack of panic comes from the habituation of good habits, habits formed during thousands of previous displacements from the center; habits that were honed so as to place him, almost sub-cortically, right back at the center of his cone, with little or no concern as to where he had been displaced to. His experience was that by thinking slow, taking a deep breath and remembering that even if all his gear failed he had four minutes or so solve his issues. Regretfully this missed being enough by a whisker. On the other hand, the new diver, imagined above, got into trouble within the limits of his training because his training never provided him (or her) with the skills and confidence required to create a self-righting system. He failed to open his valve all the way; he descended and became air starved, this was enough displacement to shove him firmly outside his cone and left him with no way to re-center himself; he lacked the knowledge (seeing his SPG flutter with each breath), the skill (comfort reaching back and turning his air back on) and the self-control to do anything but bolt. Sure, there are some major trespasses that should never be done. Overhead environs are clearly in this category. In an overhead environ a very small drift off center has a wicked first and second derivative. The lack of a safe refuge immediately above massively amplifies the displacement and is this lack of being able to predict this amplification that creates the danger. What training and experience does is reduce this amplification. But the blanket, “never dive beyond your training” is patently foolish when we are talking about, say, a depth extension of ten feet. If divers recognize that ten feet creates an amplification factor of one plus “X,” but that 20 feet is not one plus two “X,” but rather one plus “X” squared, then they will slowly, methodically and with minimal risk extend their abilities to meet the new challenges they face. I tell you that with adeqate and thoughtful training, based on the concepts outlined above, you can beat panic even if you can not absolutely guarantee survival.